When computer entrepreneur Mark Landsberg realised he needed a cash injection to see him through next month’s festivities he knew exactly what to do. Frustrated that banks are no longer lending he instead took his Porsche 911 Turbo to one of the new breed of posh pawnbrokers in return for a loan of £20,000 against its value. “In exchange for my car keys the pawnbroker transferred the cash to my bank account the same day,” explains Mark, 53, who is single and lives near Newmarket in Suffolk. Like many business owners Mark gets paid quarterly by most clients and with a tax bill looming in January the loan will cover his living costs for the next two months. “It will also enable me to have a frivolous Christmas knowing I don’t have to tap into the money set aside for tax,” he continues. And Mark is not alone. The National Pawnbrokers Association (NPA) reported a 15 per cent growth in business last year, half of which was down to more middle-class individuals and small businesses using their services. In late 19th and ‘It will me to early 20th-century Britain there were nearly as many pawnbrokers as pubs. People would pawn anything from bed linen and cutlery to their Sunday best suit to put a meal on the table. Today the pawnbroker is emerging as the high-street lender of choice for the asset-rich middle classes caught between recession and banks that won’t lend. 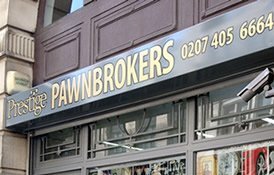 without tax The NPA now has more than 1,800 pawnbroker shops and online members in the UK, compared with just 530 in pre-recession 2007. The industry is regulated alongside banks and other financial institutions by the Consumer Credit Act 1974. Former property developer James Constantinou is chief executive of upmarket Prestige Pawnbrokers in affluent Weybridge, Surrey (prestigepawnbrokers.co.uk). Since launching the business in 2009 he has loaned against everything from property and fine wine to art, diamonds, rare books, cars, couture clothing and antiques. “We don’t need to know why clients want a loan but their reasons include school fees, dental work, funeral arrangements, utility bills, car repairs and even divorce lawyers,” he reveals. Mark’s Porsche is also on Constantinou’s list and isn’t his first foray into pawning. After reading about it on the BBC’s website, a year ago Mark borrowed £50,000 against a Lamborghini – which he has since sold – so he could invest in a business opportunity. “I’d have missed out on a lucrative deal if I’d had to rely on the banks,” he adds. “Pawning my car meant I could act quickly. “Five weeks later, by which time some of my clients had paid their bills, I redeemed the £50,000 loan and drove my car home. Like lots of business people I always have money coming in but not on a monthly basis. A pawnbroker will typically loan up to 50 per cent of the value of an item for six or seven months. At any time during that period the customer can repay the loan plus interest – which tends to be between two and seven per cent depending on the value of the item, compared with an average 19.5 per cent on a bank overdraft and 17.3 per cent on a credit card. If they fail to repay a loan they won’t get into debt as they would with a bank, the pawnbroker will simply sell the item through their shop or an auction house. Once the loan and interest have been recouped, many even pass any profit left over to the customer. enable have a On average 15 per cent of people fail to repay their loan forfeiting their item, treasured or otherwise. Ray Perry, CEO of the NPA, says that in theory you can pawn anything because what you’re doing is providing security against a loan. “So long as the pawnbroker can source the expertise to value an item, often a specialist auctioneer using money’ in the case of art or fine wine, to ensure it has a resale value then it’s perfectly viable,” he explains…. Read the full article posh pawnbrokers article on the Daily Express website.